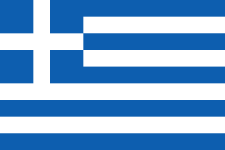 In Crete the crowds mass on the beaches of Aghios, Nikolaos and Mallia, on the site of Knossos, in the roads of Chania or Heraklion. 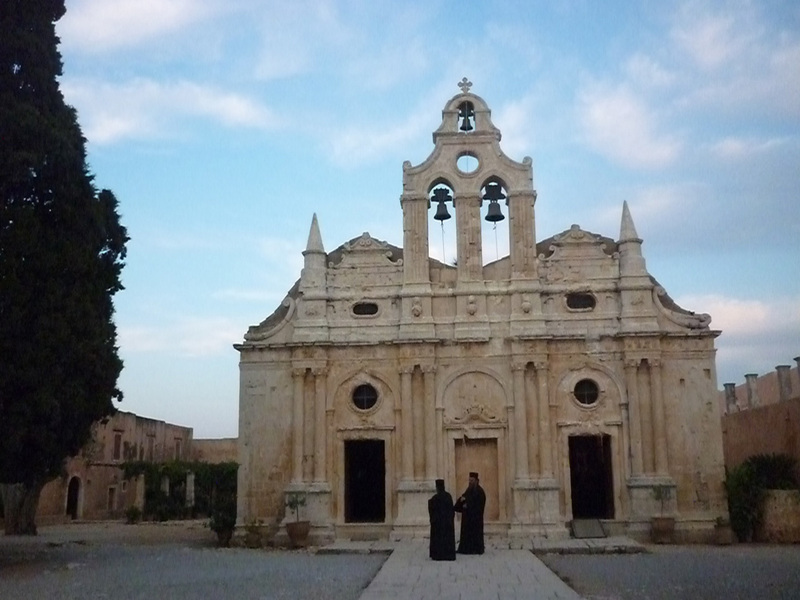 On the other hand, the little town of Rethymnon is far more calm. 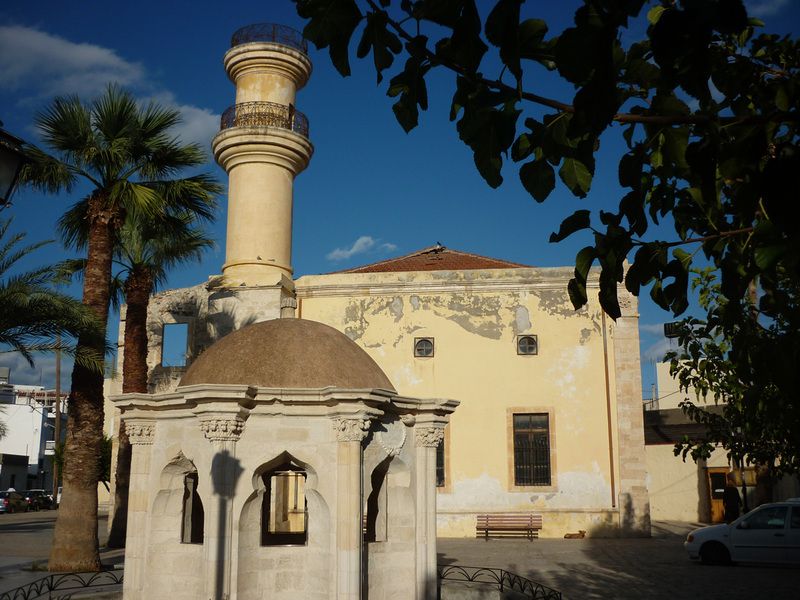 The port, as much as the Venetian and Ottoman vestiges, give the town a special charm. 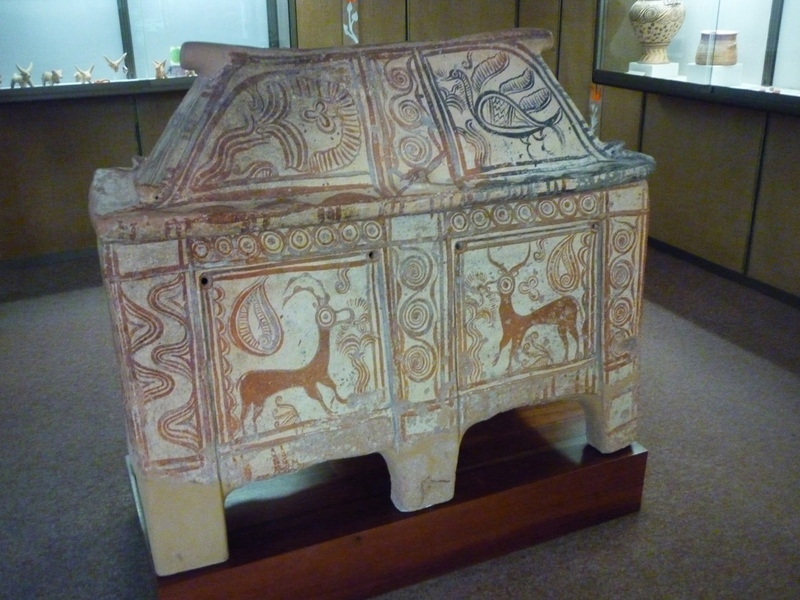 The archeological museum shows exceptional «larnakes», a type of Minoan sarcophagus, perfectly preserved. The museum of popular art, adorns itself with traditional weaving, predominately red. Travelling with just a small rucksack, I mainly bring back weaving from my trips. Therefore I set out to find a shop selling them, but I only found banal products « made in China », having nothing to do with those of the museum. Suddenly I came to a stop in front of a shop where, hanging on a wall, was what I was seeking in vain for an hour. Moreover it was a workshop of traditional instruments. I have been an amateur pianist since childhood, but I am also interested in ethnic music. 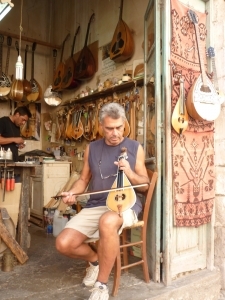 The craftsman was making two instruments typical of Crete, «laouto » ( lute ), and the older one, the « lyra » ( lyre ), which goes back to the Byzantine era and was also played in the Balkans and Turkey. In the manner of all the popular instruments of this family, it is not held under the chin like the modern violin. Moreover the fingers don’t press the strings with the soft tissue but with the nails. I briefly talked to the maker about its manufacture, and then asked him where to find the weaving I was looking for. To my delight, he offered to sell me a cushion cover in a red slightly past its best, but of an authentic design and loaded with the stories of since it had been used. 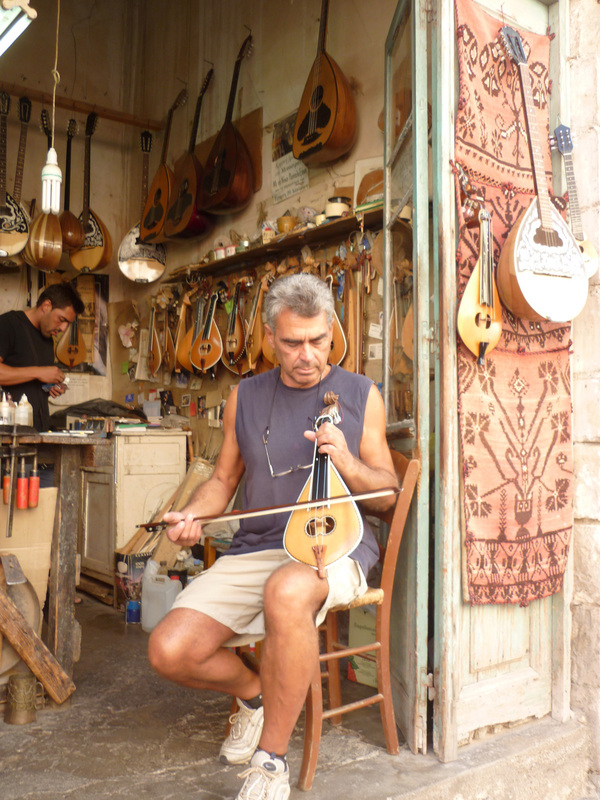 Before leaving I asked him to play me a tune on his lyre, the sounds of which opened for us the gates of the Orient. 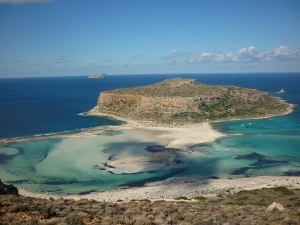 Islet of Imeri Gramvoussa. Peninsula of Gramvoussa. That morning, having driven for an hour at walking pace on a very stony road, I was rewarded by the extraordinary panorama which appeared: the peninsula of Gramvoussa and its turquoise lagoon, at the extreme North West of Crete. 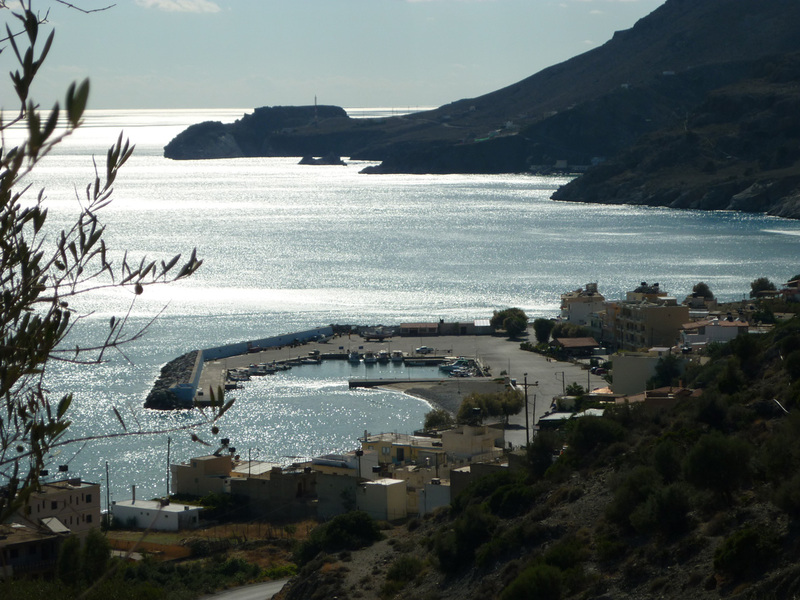 Then I visited the nearby ancient port of Phalasarna, now separated from the sea because, in the seventh century AD, a powerful earthquake tilted Crete by seven meters from west to east. 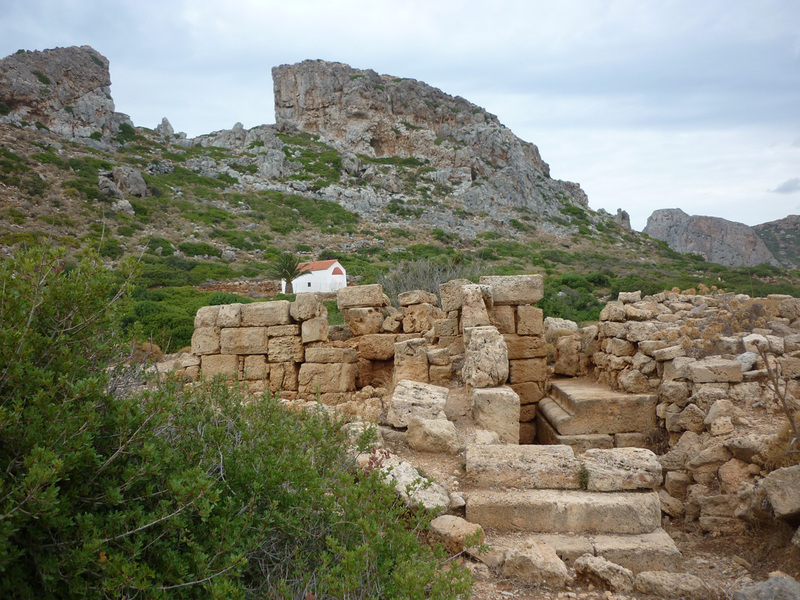 At the end of the afternoon I set out to find the Byzantine chapels in the region of Kandanos. The advice of the guide book being very vague and the night falling, I took a room in that village, which had been razed to the ground by the Germans in 1943. 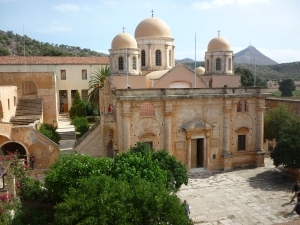 Example of a Cretan church with two naves at Etia. The next day I resumed my search using tiny tracks, but in vain. 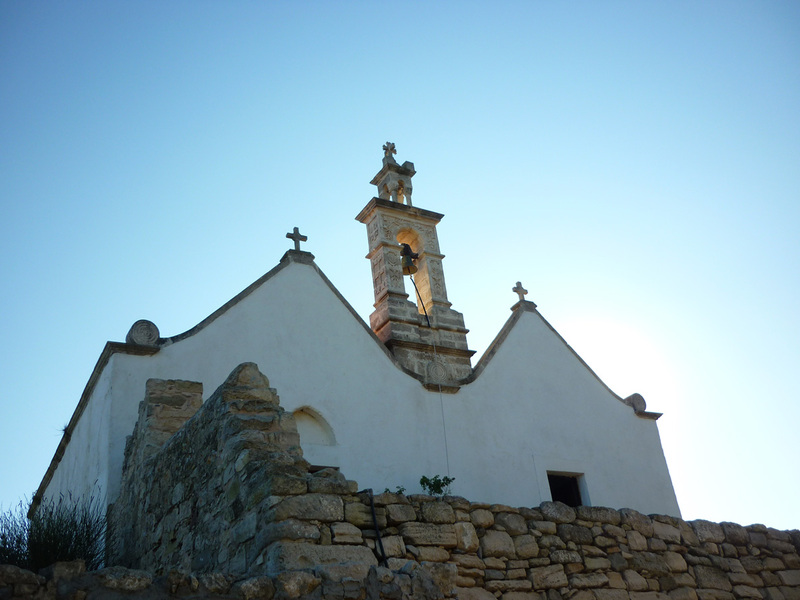 Luckily I came across a middle-aged man who offered to guide me on foot into the middle of woods and olive groves. I would have found nothing without him, especially as, looking for domes, I had passed alongside chapels which, from the outside, looked more like barns. In fact, Cretan churches are more often rectangular and have one, two or three naves with gabled roofs. This man was a marine on leave. He showed me the frescos of four chapels, one of which was flanked by a little graveyard where he showed me the grave of one of his uncles. 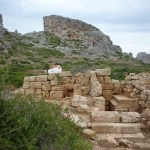 Having noticed that some of the deceased had died quite young I expressed my surprise to him, this island being famous amongst my people for its centenarians, thanks to the famous Cretan regime. He sadly explained that it was the fault of the American base at Souda, at the entrance of Khania Bay. According to him, they had carried out chemical experiments which had increased the number of cancers. I refrained from contradicting him, in spite of the lack of truth in this hypothesis : isn’t it the universal reaction to human misfortunes, to look for a scapegoat? The « Iron Gates ». 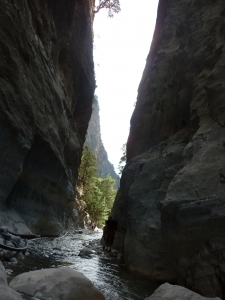 Samaria Gorge. 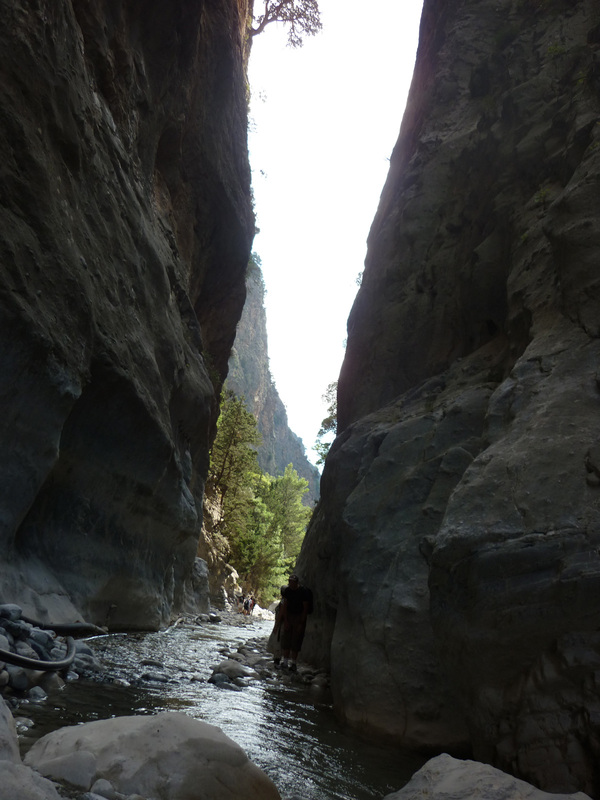 « Thermopyles » of Crete : during their entire occupation of the country, the Turks never passed through them. 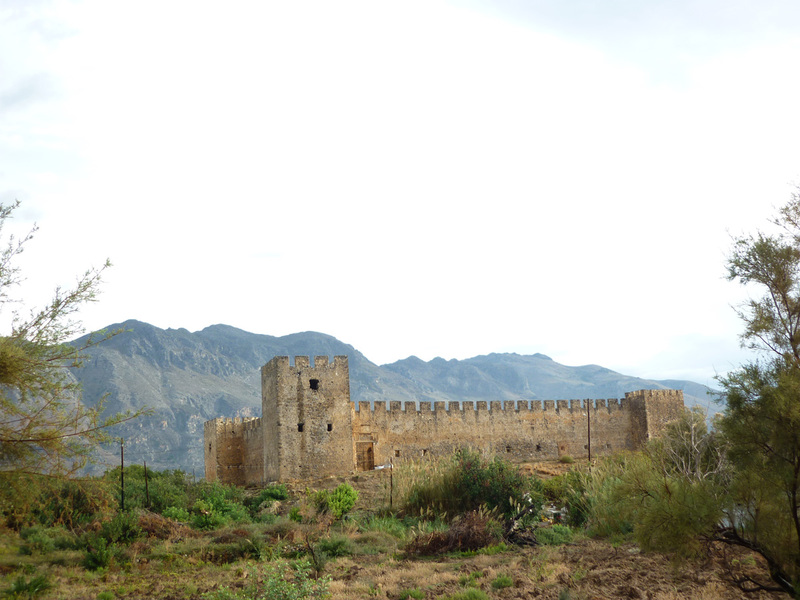 Still aching from my descent of the Samaria Gorge, stunning indeed, but lasting six hours over stoney ground, I made my stop at an isolated inn in a beautiful garden beside the fortress of Frangokastello. 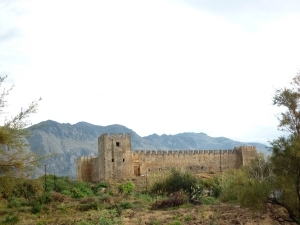 Venetian fortress of Frangokastello. 14th century. Once more I was the only customer and chatted for ages with the patron. She had left an office job in Athens to take on this hotel, the owners of which had retired. Her only companion, a solid pit-bull, trying to betray the reputation of his breed, was very friendly to me : dogs are only dangerous if their masters train them to be wild. His mistress and he answered to the names, strange in that country, of « Betty » and « Fidele ». For curious tourists she had put out on a table several books about the region and a prospectus in Greek detailing the history of the fortress. 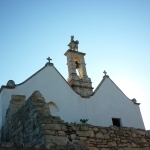 It was erected by the Venetians for whom it served as a refuge from pirates. Occupied then by the Turks to protect themselves against the Sfakiotes, the local inhabitants, as redoubtable as those of the Mani, it was on several occasions the scene of bloody combats, where the Greeks, far inferior in number, were eventually crushed after heroic resistance. 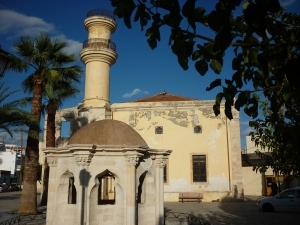 Rebuilt by the Turks, it is externally intact but the interior preserves only the ghosts of the besieged who had, during a siege, stacked the bodies of their horses to block the gate. The next day I could only pay for the room, the locality had no cash dispenser nor could one pay the hotel by credit card, often the case in these remote places. As I had offered, the night before, to translate the prospectus into French, the owner said to me with a smile that I would settle the bill by sending her the translation. That’s what I did on my return home, adding a 20 euro note. I will never know if my letter got through to her but, if not, I hope that I have paid off my debt through this little piece of text.